DMG Productions explores advances in neurotechnology. "We strongly believe in neuroplasticity and want to give the opportunity to everyone to train their brain." An upcoming episode of Advancements with Ted Danson will explore recent developments in neurotechnology and will educate about innovative tools and devices being used to enhance cognitive skills. This episode is scheduled to broadcast 3Q/2019. Check your local listings for more information. This segment of Advancements will focus on Sound for Life, a neurotechnology company helping people to reach their potential and improve quality of life through brain stimulation. The show will educate about how Sound for Life is helping children and adults become more empowered and overcome learning, attention, speech and language, sensory and auditory challenges. “We are very happy to be given the opportunity to present Forbrain and to detail the variety of its applications to enhance learning for all, whether for students, parents, teachers etc. We strongly believe in neuroplasticity and want to give the opportunity to everyone to train their brain and feel that they are at their full potential,” said Thierry Gaujarengues, CEO. The show will discover how Sound for Life is using technology to make an impact. 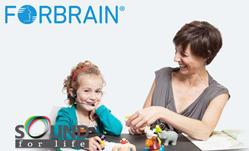 Its products; Forbrain® and Soundsory, will be highlighted. SOUND FOR LIFE Ltd is a Hong Kong based company, with offices in Europe and in the US. Sound for Life specializes in the development of efficient products to support cognitive abilities and skills, and to help people reach their full potential and enhance their quality of life. Sound for Life products inherited from the knowledge of years of sound therapy research. For more information, visit: http://www.forbrain.com or call +1 469-579-83-56. The Advancements series is an information-based educational show targeting recent advances across a number of industries and economies. Featuring state-of-the-art solutions and important issues facing today’s consumers and business professionals, Advancements focuses on cutting-edge developments, and brings this information to the public with the vision to enlighten about how technology and innovation continue to transform our world. Backed by experts in various fields, DMG Productions is dedicated to education and advancement, and to consistently producing commercial-free, educational programming on which both viewers and networks depend. For more info, please visit: AdvancementsTV.com or call Amy Casal at 866-496-4065.